STOPLINE-L vandal-proof arm barrier is designed to restrict access in areas with higher risk of vandalism. Sadly, we face manifestations of vandalism on the part of motorists who drive through an accidentally open arm barrier, damage its plastic boom on exit, or make a detour of congested roads across countryside villages, disturbing their inhabitants. Idlers harm ordinary arm barriers obstructing the passage. Many times damage is caused to arm barriers with plastic booms designed for orderly entry control. The solution we usually offer is vandal-proof barrier with aluminum boom 400 mm high, welded of rectangular section. With its truss-shape structure the closed boom can hold the weight of several people. The look of this barrier wards off anyone willing to try to open it. Anything can be broken, should that be the purpose, but usually they break things that yield easily. For this product one would need instruments or great strength. 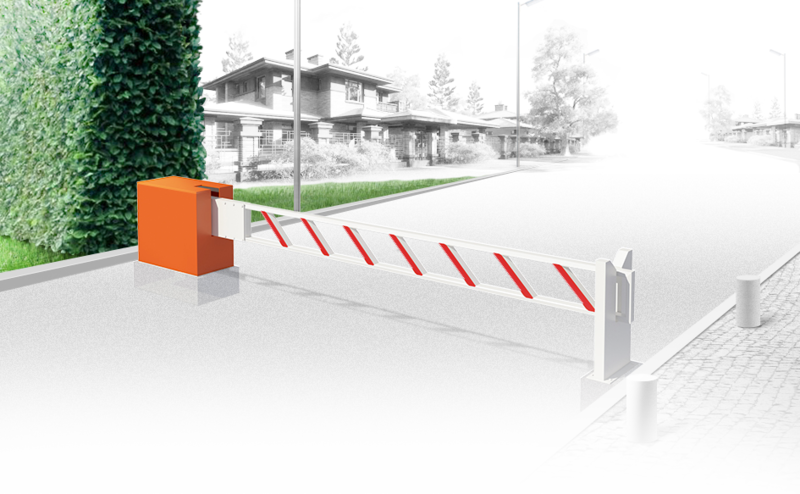 STOPLINE-L vandal-proof arm barrier is anchored over the roadway and does not require professional installation. If a vehicle hits the arm barrier, the boom can be ordered separately and replaced on site. Along its full height the boom has reflector stickers placed at an angle, which enables the arm barrier to be unmistakably identified as an obstacle. If you plan to use the arm barrier for a long period without spending time and money on maintenance, we recommend considering the option with corrosion protection achieved through hot zinc plating or coating with zinc-containing primer. Hot zinc plating method enables creating reliable galvanic protection to operate an arm barrier for decades without cares about rust. Zinc priming is more suitable for northern regions, as not all cold-resistant steel can be properly hot zinc plated. Zinc primer has over 90% zinc, also providing galvanic protection, with application method different. The drive used in the vandal-proof arm barrier has protection level of not less than IP67, which allows operating it in any weather conditions. The number of operations to failure of such motor exceeds 350 thousand cycles. For convenience, the arm barriers can come with radio remote controls for all users. The arm barrier power cable can run either back or underground, depending on installation possibilities.